After three long and challenging weeks, Sandy Hook Elementary students returned to class Thursday at a nearby middle school in Monroe, Conn., where they will remain until their old school is no longer designated a crime scene. NBC's Rehema Ellis reports. The children of Sandy Hook Elementary School returned to class Thursday, filling buses that took them to a new building where they were thrilled to reconnect with their friends and teachers after three weeks of mourning. “Most of the kids were excited,” said Monroe, Conn., Police Lt. Keith White. The 400-plus students had not been back to school since Adam Lanza blasted his way into Sandy Hook and killed 20 first-graders, six staffers and himself with a semi-automatic rifle. Their old school in Newtown is still a crime scene, so an unused middle school in nearby Monroe was refurnished for them. Teachers tried to make the new surroundings as familiar as possible. Their old desks were brought in, along with backpacks, coats, and lunch boxes that were left behind as they fled on Dec. 14. Even the new principal was a known face: Donna Page, who retired from the role at Sandy Hook in 2010, agreed to come back after her successor, Dawn Hochsprung, was killed in the rampage. Yet there were also reminders of how much the Sandy Hook community has changed since the shooting rocked the nation and stirred debate on gun control. Police officers and counselors were on hand. Parents were allowed to stay in the building for the day. And children cuddled with therapy dogs. He said attendance was robust, with most school buses full as they rumbled down streets that had been decorated with balloons and welcome signs. Andrew Paley said he waited for the bus with his 9-year-old twins at the bottom of his driveway Thursday morning. While security was very visible, it will become more low-key as the weeks pass in an effort to restore some normalcy. “We don’t want them to think this is a police state,” White said. “We want them to know that this is a school and a school first, and that’s a place that they are to come to learn, enjoy their friends and grow up. Lt. Keith White says Sandy Hook students were excited to see friends as they returned to school on Thursday for the first time since the Dec. 14 massacre in Newtown, Conn.
Connecticut Gov. 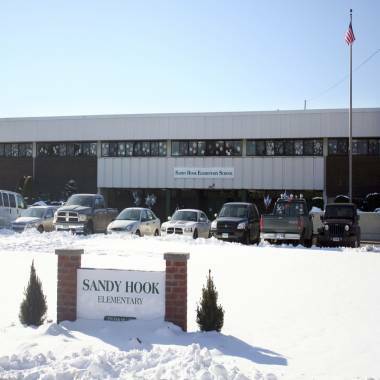 Dannel Malloy said it took a “Herculean effort” to prepare the school in Monroe for the Sandy Hook kids. He also announced a commission that will spearhead legislative and policy reforms designed to ensure no other children have to endure the horror they survived. He said the 15-member commission would look at three areas -- school security, mental health services, and gun laws. “If 30-round clips had continued to be illegal in the nation or in our state, the availability of that clip to this particular perpetrator may not have existed,” Malloy said. The panel, which will issue recommendations in March, will be headed by Hamden Mayor Scott Jackson, who said the issues resonated with him personally. NBC News' Joo Lee contributed to this report. 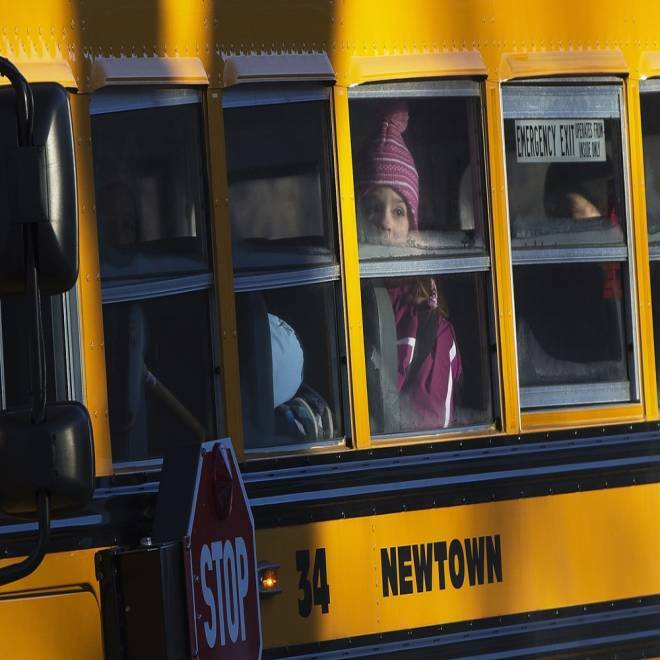 Children from Sandy Hook Elementary School make their way to their new school in Monroe Conn. As they leave Newtown on Jan. 3.